GARDENA, Calif. – Nov. 17, 2016 – In keeping with the spirit of giving, the Carroll Shelby Foundation will take its fourth annual holiday ornament fundraising campaign full-throttle. The new exclusive ornament, available only through the charity, pays tribute to more than 50 years of legendary Shelby performance through the metal die-cut ornament in the shape of the first Cobra (CSX2000). Proceeds from the sale of the ornament will provide medical assistance and educational opportunities for children and young people. This year’s holiday ornament pays homage to the car that started it all – the first Cobra, CSX2000. Hand-built by Carroll Shelby in 1962, CSX2000 represents the Shelby performance vehicle that gave birth to an automotive dynasty. 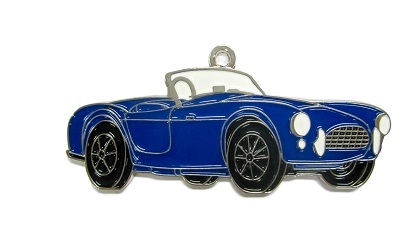 The Carroll Shelby Foundation is offering the dazzling collectible both online and at Carroll Shelby’s Store for $20. The only official 2016 Shelby holiday ornament in the world, it is available for pre-order and can be shipped within the United States beginning November 28, 2016. To learn more about the Carroll Shelby Foundation, make a donation or to order an item with the exclusive commemorative signature, go to www.carrollshelbyfoundation.org. The Carroll Shelby Foundation was created by legendary racer and automotive manufacturer Carroll Shelby. Headquartered in Gardena, Calif., the Foundation is dedicated to providing medical assistance for those in need, including children, educational opportunities for young people through automotive and other training programs and benefitting the Shelby Automotive Museum. For more information, visit www.carrollshelbyfoundation.org.